(Note: this post is an excerpt from my book, Monuments: One Atheist’s Tour of Time, Culture, and Meaning.) Plutonium is an artificial metal first synthesized in 1940. It’s easily oxidized, silvery gray, a bit like lead but heavier and much harder. A golf-ball size piece of plutonium weighs more than two pounds. If you try to saw that golf ball in half, it would wear out a hacksaw blade in a hurry. But best not to try. The dust is radioactive and also just, plain poisonous. If ingested, it heads straight to the bones. In short, plutonium is way dangerous stuff. If you have golf balls of weapons-grade plutonium, and snap a few together fast, you get a hell of an explosion. But all plutonium isotopes require specialized handling. They’re made by the standard breeder reaction process, bombarding U-238 with neutrons from a U-235 reaction. Sadly, we were using nuclear reactors to build bombs years before we learned to generate electricity with them. Even more sadly, for every ounce of weapons-grade plutonium, we made several ounces of deadly, radioactive byproduct. It all had to be stored somewhere. Plutonium is the ultimate gift that keeps on giving. In the worst possible way. In southeast Washington State, the Columbia River makes a three-qarter circle as it joins the Yakima and Snake Rivers, then heads west, toward the Pacific Ocean. Within that loop lies the Hanford Reach, broad flatland bounded on three sides by river. At its south edge lie the towns of Kennewick and Richland. That was my next destination on my driving tour. I crossed the Columbia, sped up a range of low hills, and the crest looked out over grassland sprawled as far as the eye could see. It faded in haze to the horizon. Without plenty of cooling water, a breeder reaction just produces a messy, sizzling explosion. This loop of river became the perfect site to make plutonium for the Manhattan Project. So called “B-Reactor” still stands at the north end of the Reach. 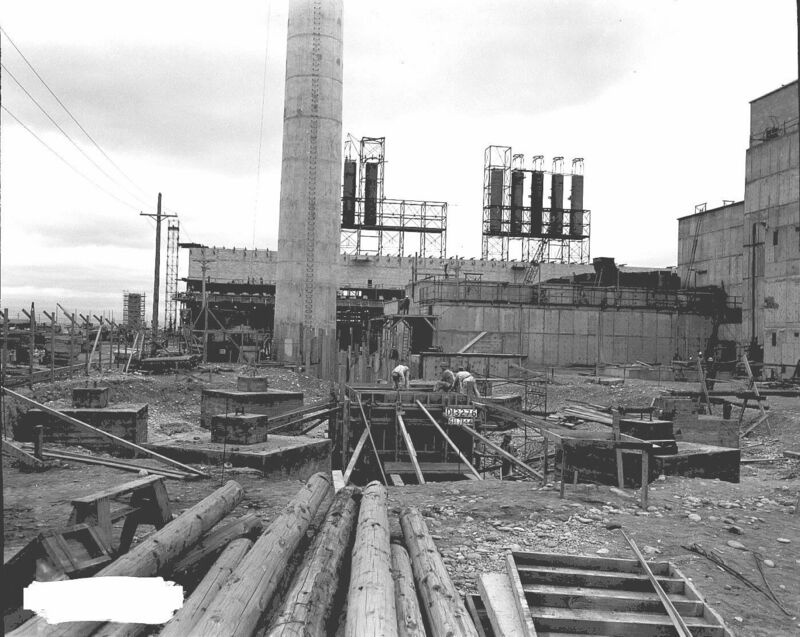 B-Reactor is the one breeder reactor whose plutonium was used in anger and actually took lives. Then as the arms race escalated we built another breeder reactor, then another. By cold war’s end nine huge, blocky structures brooded in a great arc along the Columbia, cranking out plutonium–and radioactive waste–in industrial quantities. Breeder reactors produce bomb material, radioactive waste, and superheated water which got dumped back into the river. That’s bad for fish and wildlife. The indigenous Nez Perce and Yakima people, some of whom got shooed away when the government claimed the land, protested as damage to their fishery became obvious. Some reactors have now been torn down. Others loomed in the distance before me, like cyclopean temples. B-Reactor closed in 1968, but survives as a museum. I turned onto a two-lane highway and drove 20 miles north, up the Reach’s west side. Where a bridge re-crossed the Columbia, I pulled of at a large historical marker. It had been shot full of bullet holes by gun-toting vandals, but I could still read it. A diagram laid out B-Reactor and explained its workings. As a positive, as the government shut down breeder reactors, the prairie around the complex became Hanford Reach National Monument. On the negative side, the Hanford Site is one of the most toxic places in the world. It holds two-thirds of the nuclear waste in the United States, the radioactive risk of which can hardly be overstated. The financial cost of storage and chemical processing facilities can’t be overstated, either. When I read news articles from B-Reactor’s salad days, I never saw anyone worrying about the ultimate cleanup price. It was all about ending World War II, then about winning the arms race with the Soviet Union. For decades it was unpatriotic to say anything about environmental damage from our nuclear defense industry. We realized slowly–all too slowly–cleanup is incredibly complex and expensive, and will go on for at least another generation. Sixty million gallons of waste lie in dozens of underground steel tanks. Because it’s so much nastier than anyone realized in the 1950’s, we must now re-treat and re-despose of the entire mess. The plan is to melt it into glass, then confine it in steel canisters, which we will bury to a harmless depth. We hope. Total cost, perhaps, $75 billion dollars. That’s 3/4 the cost of the whole Viet Nam War. It now turns out, the problem is even worse than that. The contractor in charge of existing tanks spent a year denying that said tanks had begun to leak radioactive sludge. Now that the leakage is confirmed, both the government and the contractor must extensively revise their plans. At appropriate added cost and time. So there I stood on the north bank of the Columbia, looking across the broad waters at buildings were, for decades, death was placidly manufactured. It was a luscious, warm autumn day, a bit of a breeze. It all looked quite innocent. I’ve seen it before, but I never recognize it till well after the fact. It’s not just the banality of evil, though the Native genocide, for one, shows how evil can be institutionalized until it really is banal. It’s the banality of industrialized death, as well. In the end, future generations may have a hard time distinguishing between the two.